One theory of a newly discovered type of black-hole quasar suggests gas flows into a central black hole. More frequent particle collisions close to the black hole make the gas hot in regions that are closer to the center (shown in blue and white). Regions further away are cooler (yellow and orange). The most luminous objects in the universe keep getting more mysterious. Astronomers have discovered a new type of quasar — an incredibly bright galactic core powered by a supermassive black hole — that current theory fails to predict. 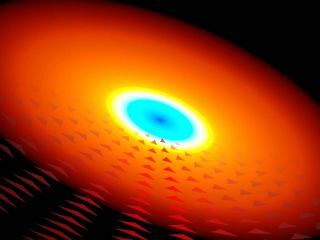 "Matter falling into black holes may not sound surprising," study lead author Patrick Hall, an astronomer at York University in Toronto, Canada, said in a statement. "But what we found is, in fact, quite mysterious and was not predicted by current theories." So far, astronomers have found 17 of these objects, which are thought to make up just 0.01 percent of all quasars. Gas flow in and around quasars can be calculated by examining its Doppler shift, or the change in the wavelengths of light that are produced as the gas moves. On Earth, humans can hear the Doppler shift in action when a car toots its horn as it zooms by. As it comes towards you, the sound waves are compressed and the horn's pitch sounds higher. After it passes, the sound waves lengthen and the pitch drops. Particles of gas in a distant galaxy emit light at expected wavelengths. This changes as the gas moves toward Earth or away from it. Gas receding from Earth is shifted to the red edge of the light spectrum (which has longer waves), while gas moving toward Earth appears more blue. Quasar light is easy to track because it is astonishingly bright, producing "enough light to be seen across the observable universe," York University officials said in a statement. The appearance of these newfound quasars, however, generated a mystery. "The gas in the disk must eventually fall into the black hole to power the quasar, but what is often seen instead is gas blown away from the black hole by the heat and light of the quasar, heading toward us at velocities up to 20 percent of the speed of light," Hall said. "If the gas is falling into the black hole, then we don't understand why it's so rare to see infalling gas," he added. "There's nothing else unusual about these quasars. If gas can be seen falling into them, why not in other quasars?" One theory suggests the gas is not descending into the black hole but instead is circling it after the quasar pushes it away. This means that some particles of gas in the galaxy would be moving toward Earth, while others are moving away. "To make an analogy: Imagine an ant on a spinning merry-go-round, crawling from the center to the edge," Hall said. "You will see the ant moving toward you about half the time and away from you about half the time. The same idea could apply to the gas in these quasars. In either case, the gas in these quasars is moving in an unusual fashion." Astronomers found the quasars using data from the Sloan Digital Sky Survey (SDSS-III), which examines large swaths of the sky. Scientists expect quasar models will have to be revisited, so the researchers plan follow-up surveys using the Gemini Observatory. The research was published Sept. 1 in the Monthly Notices of the Royal Astronomical Society. Editor's Note: This story was updated on Nov. 13 to correctly identify the location of York University in Toronto, Canada.